One of the in-person events in my almost-entirely-virtual book blogging life is Book Expo America. It’s a conference/book fair hosted in New York City each year, and the attendees and exhibitors are booksellers, librarians, publishers, educators, authors and others with a professional interest in the business of books. When I went this past June, I met a virtual Creature from the imagination of Robert Paul Weston. And when I say ‘met,’ I mean a digital creation named Gügor was on a large screen, greeting visitors to the Penguin booth and having short conversations with them. But what IS Gügor anyway? He’s a Creature, from The Creature Department, an adventurous and monster-filled middle grade book! Elliot von Doppler is a science-obsessed twelve year-old. Leslie Fang could be described the same way. But while Elliot grew up in Bickleburgh, Leslie just moved to town with her mother, and the two children only know each other because they tied for 3rd place in a science competition. When Elliot finally gets the chance to tour the famous DENKi-3000 electronics factory (and really the only exciting thing about the entire city of Bickleburgh! ), Leslie is invited too. There they discover that Elliot’s uncle Archimedes has been in charge of a most interesting research and development department – one run by and devoted to Creatures! Elliot and Leslie will need to race against time to help the Creatures invent one more new product and prevent the shutdown of DENKi-3000. In The Creature Department, Robert Paul Weston introduces a laboratory full of inventive monsters who work with Creature physics (entirely different from human science!) to create new, exciting and original inventions. They invent things like TransMints, which combine elements of technology, freshness, and the best memories of winter to produce some of the finest candies ever. The trouble is that the Creatures (all uniquely terrifying/interesting/wondrous in their own ways) haven’t invented anything in a long while, and the company’s shareholders are getting restless. They are even considering selling to Quazicom Holdings, run by the mysterious Chief, a shadowy figure with less-than-honorable intentions. Into this world of deadlines and science wander Elliot and Leslie, two curious kids who might possess the Knack needed to come up with something truly special to save the day. 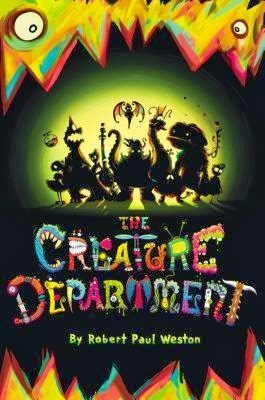 The Creature Department is an appealing tale of non-humans of all shapes, sizes, and strengths, and the power of friendship to bring any group together. Weston writes convincingly of Creature attributes that may make the reader grimace, squirm, or crow with delight, and possibly all at the same time. It’s full of middle grade appeal, with a glow-in-the-dark cover, gorgeous illustrations throughout by Framestore artists, gobs of snot and goo, and enough journeys above and below ground to please most readers’ expectations for adventure. That said, the characters were simply that – characters. With one or two exceptions, they remained static. In addition, there were a few scenes that tried to make something of the fact that Elliot is a boy and Leslie is a girl and they’re working together *wink, wink*, which seemed out of place in the narrative. Creature science also bears no relation to human science (duh). If you let your imagination run wild it’s a lot of FUN, and a quick, simple, fantastical trip into a weird and astonishing secret world. Recommended for: fans of the Disney/Pixar Monsters, Inc. films, young readers who enjoy off-the-wall adventure and stories about kids saving the day, and people of all ages who daydream about impossible inventions. Check back in tomorrow for an interview with author Robert Paul Weston and an international giveaway! Fine print: I received a finished copy of The Creature Department from the publisher for honest review. I did not receive any compensation for this post.